21 July 2017 — SMEs have limited resources and CFOs are often unable to spend enough time on strategic initiatives. Our simple framework is a tool to develop the finance function to enable CFOs to participate more actively in strategic initiatives and maintain a high-level perspective. SME management needs an unbiased fact-based financial perspective to support their decision making. Yet the finance function in SMEs often struggles in providing strategic insight and analytics to top management. Given the limited resources in SMEs, CFOs are often over-burdened by routine tasks and daily problem-solving. Daily fire-fighting diverts focus away from building a top-down view and developing unbiased financial insights. A structured framework helps streamlining processes and building a scalable setup. By taking a staged approach to finance development, CFOs can release time for strategic tasks, and increase their value contribution. The role chief financial officers (CFOs) has traditionally been to report internally and externally, providing the financial perspective on performance and outcomes of initiatives. However, in small and medium enterprises (SMEs) and startups, financial resources are limited and affording personnel in cost positions can hinder growth. Improving finance function efficiency enables CFOs to expand their role beyond reporting and financial analysis, and to be involved in strategic initiatives to increase the value created for the organization. We interviewed 10 CFOs of Finnish SMEs and startups, focusing on how they add value within their companies. We found that the limited resources in the finance team, a wide variety of manual routine tasks, and frequent fire-fighting all contribute to distracting CFOs from more value adding activities. In addition, few CFOs find enough time to take a big picture view on their own function, and how to develop it further. Instead, they find themselves caught in a quagmire. To reverse the situation, and to increase the impact of the finance function, CFOs need to restructure their work and carve out time for a strategic viewpoint. In this article, we seek to show how, with the help of a simple four-step framework. The simple framework can guide CFOs to identify the development focus areas for the function, and allow them to devote more time to strategic activities (figure 1). The first element to consider is whether the structure and the processes are streamlined and automated, scalable to sustain growth, and supporting the company operations. Streamlined and standardized processes and routine work enable CFOs to collect the required data to develop a solid understanding of the company and the industry. With this knowledge, CFOs can manage performance by setting targets and tracking the progress. CFOs are then able to focus on leveraging their knowledge and strategic vision to lead business initiatives and develop the company strategy with the management team. As most SMEs continue to develop their processes as they grow and mature, there are different levels for the finance function to contribute to the organization. An essential initial step is to recognize on what level the company currently is, before developing a realistic roadmap for the development of the finance function. In what follows, we describe the four steps to value creation, and provide examples of key activities and potential pitfalls to avoid, along with best practices for success. 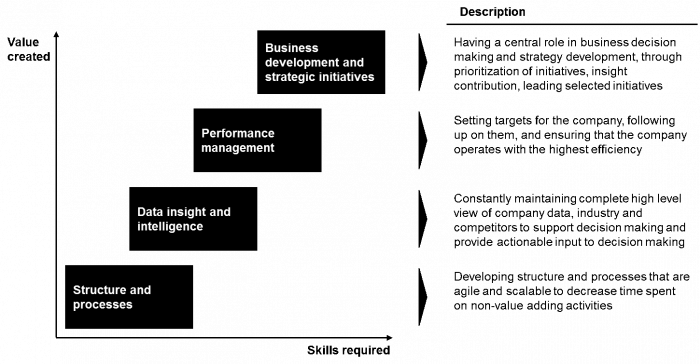 Within the framework, the first two levels establish the basics within the company. At the beginning of the company’s lifecycle, one best practice is to define the structure and vision for the finance function based on the needs and current capabilities. The relevant IT tools can be selected to support accurate and timely data-gathering from the operations. Managing data structure is essential to ensure data quality and sets a solid foundation for automation efforts. Especially for SMEs, data structure and hierarchy should account for the company’s growth ambitions and the need for scalability. In addition, documenting processes and roles, both within the finance function and the whole company, clarifies the responsibilities and focus areas of each. One main way to decrease the time spent by CFOs on reporting and data collection is to leverage automation and analytics tools to streamline the processes, which also increases reliability of the data. Another mean to increase efficiency is driving standardization of processes, for example of report formats and meeting agendas. While laying out the bases and establishing the structure, it is important to design the systems, tools and processes with the organization’s current and future needs in mind. Otherwise, scalability may be limited and consequently decrease efficiency of the finance function in the future. Additional consequences include that CFOs must redesign the processes or data structure, which may be expensive and time consuming. The value of the structure and processes should not be under-estimated. Consider the case of a startup in the food and beverage industry. The company focused from the start on data analysis and developing financial forecasts. A monthly report was produced for the board of directors. The monthly effort to develop the report proved time-consuming, as several data points needed to be calculated manually. Best practices are to invest time early on to establish the data gathering process, starting by the identification of the required data and then recording the necessary data points with the system. Established processes, tools and structure enable the CFO to focus on building a high-level view on the company data. Combining it to industry and competitor data to provide context to internal data enables developing actionable recommendations. From the internal and external data gathered, the CFO can confidently build reliable financial forecasts and dashboards to track progress, which can be communicated and shared within the company to support data-driven decisions. While collecting and analyzing data, possessing the high-level view on the business dynamics between value drivers and company performance is critical. It enables to build forecasts based on key value drivers rather than generic assumptions, such as monthly fixed-growth estimates. The lack of justifiable and data-driven forecasts may have serious consequences: the lack of reliability could cause the company to suddenly run out of capital to sustain the operations. With increased availability of data, it is recommended to identify the required data points and focus for the financial analysis to optimize the time spent by the team data-crunching. A Finnish professional services startup initially focused on analyzing items within the profit and losses statement. Several analyses were conducted, but no clear actionable insights were derived. The company automated and standardized reports too early, generating many reports, yet lacking the focus on key drivers. For young companies, cash flow is often more critical, and should have been the focus for the analyses. While leveraging the available data, it is natural for organizations to recognize that the evolving context or data collection is not fully supported by the processes. It is recommended to periodically evaluate and validate it, and to make the necessary adjustments. Maintaining a strong understanding of data, key value drivers and reliable processes enables CFOs to devote more time on performance management – including target definition and follow-up, ensuring efficient operations, following company milestones and stakeholder communication. To manage performance, one best practice is to set company-wide and individual targets and incentives in parallel to developing tools to track and report the progress. From this point, the true value from the CFO expertise can be unlocked. CFOs can analyze and identify the opportunities for profitability improvements or growth, which can be challenging with the burdensome day-to-day routine. To support efficient operations and add value through performance management, an important element is to define incentives that support value creation for the company. This may be achieved by ensuring that individual goals trickle down from and support the unit’s and company’s targets. Target settings should be conducted top-down to best support the company strategy. Setting and communicating targets must be done meticulously. When targets are too low, the organization may become complacent, and the company might not reach its full potential. Oppositely, too high targets may impact the motivation across the company, as people may deem the targets unachievable. Target communication is not limited to an internal scope, but also spans to external stakeholders. An online retail startup was seeking funding, and presented high financial targets to potential investors. As the targets and promises were unrealistic, the investors doubted the ability of the company to reach them, and decided not to invest, resulting in serious financial challenges. Finally, leading business and strategic initiatives is where CFOs can contribute the most value to the company. CFOs can be considered value managers and present the unbiased voice of finance, as they can hold a central role in business decision making and strategy development. Concrete examples of activities that CFOs can lead at this level are setting, together with the management team, the priority of different initiatives, or developing a governance roadmap, elevating the role CFOs to the level of strategic partner. They can also develop data-driven insights and scenarios to support decision making. When prioritizing new initiatives, CFOs can leverage their asset management capabilities to optimize the capital and resource allocation, and actively challenge the thinking within the management team. Furthermore, the financial perspective of ongoing activities is critical to decide when initiatives should be accelerated or reduced. While evaluating the different options to allocate capital and resources, a thin line exists between being realistic and bearish. Although investment opportunities must be carefully examined, a bearish interpretation of proposals may lead to missing important value creation opportunities. It can contribute, over time, to create a pessimistic company culture where new ideas are too often shut down. The degree of scrutiny applied for the proposals should be based on common sense. In many cases when the cash outflow value is minor, the time required to build the business case and evaluate the opportunity is too high. The CFO must make a judgement call. A Nordic technology company uses “the rule of three” as a guideline to efficiently decide on spending resources, implemented on all levels within the organization. The capital use proposal is green-lighted if it provides benefits for (1) customers, (2) employees, and the (3) the company. While the company evolves and the opportunities for the CFO to create value increase, the key roles and required skills from the CFO change accordingly. Within early stage companies, CFOs often spend most of their time on hands-on work, reporting and making analyses themselves. Technical skills are important to establish sound processes and structure. The scope of the CFO role often encompasses several functions, such as IT, legal, HR, and sometimes operations. One key to optimize the time spent is to automate processes and leverage analytics tools to increase the time spent on interpreting the data rather than collecting it. As the company grows or matures, new candidates will often be recruited to lead other functions, and the finance team will expand. The role of the CFO transforms to focus more on people management, coaching and leading. Interpersonal skills are critical to ensure clear guidance and communications. Additionally, when CFOs contribute at the strategic level, communication skills and the ability to form opinions and an own agenda, or vision, is central to value creation. CFOs sit on a mountain of knowledge, insights and data, and leveraging it to drive collaboration and decision making is highly valuable. As CFOs constantly face time challenges and the daily problem solving, it is important to prioritize their and their team’s time according to the most critical areas for the company. In other words, the ability to evaluate the level of maturity of capabilities within different areas, such as planning, reporting, or managing receivables, and to identify where additional investment creates the most impact for the company is key to an efficient finance function. As different companies face different realities and challenges, the previous guidelines should be used as a reference, as the different steps may have a different level of relevance. Notwithstanding, the framework can be used as a tool to reflect on and plan the development of the finance function. A simple first step for CFOs toward an improved finance function that contributes additional value is to take a step back to evaluate how the function currently operates, what are its strengths and where lie the opportunities to improve. In all cases, once the basics are in place, the CFOs can evaluate further the potential focus areas and validate that their experience and knowledge are leveraged to create the highest business impact. Accordingly, they worry less about being overwhelmed by the daily tasks that currently often take too much of their time. Pausing for a look at the big picture top-down and thinking through the real value drivers of the company will pay off handsomely. 18 September 2017 — In a world of continuous change, companies should turn market pressure into a change capability that becomes a competitive advantage. Appointing a chief transformation officer to comprehensively lead change itself is a solution. 15 September 2017 — With the increasing importance of customer experience across industries, B2B companies can differentiate by borrowing from the B2C playbook and simplifying their customer interface, facilitating relationship management, and developing digital customer portals. 30 March 2016 — Low productivity is the main challenge facing Southeast Asian economies. There is a macroeconomic imperative to boost productivity but implementation is difficult. In this article, we address automation, efficiency and human capital development as key new business development areas in the region. 6 March 2016 — Between 2013 and 2015 hype around indoor tracking built up. Yet today nobody seems to talk about indoor tracking or remember the apps. While the hype has died, work has continued in the shadows addressing both issues with tracking technology and indoor maps.